In response to fiscal pressures and broader societal trends, many governments are seeking to unlock greater value from their infrastructure investments and procurement spending. Through community benefits and social procurement policies, which align spending and purchasing activities with broader public policy objectives, governments are changing the way they do business to reap greater social and economic benefits. In Canada, the federal government, the province of Ontario, and the City of Toronto together spend upwards of $23.5 billion per year procuring goods and service, including construction. By embedding community and social benefits criteria into public contracts, governments can leverage this vast public spending to support important socio-economic goals, including poverty reduction, improved labour conditions, and greater equality of income. Businesses, too, are demonstrating greater willingness to meet rising contractual obligations to secure valuable government contracts and sharpen competitive advantage. At the same time, a growing social economy sector and the explosion of social enterprises is creating a new landscape for socially-driven procurement. In many jurisdictions, this has led to a unique window of opportunity to pursue transformational community benefits and social procurement policies. 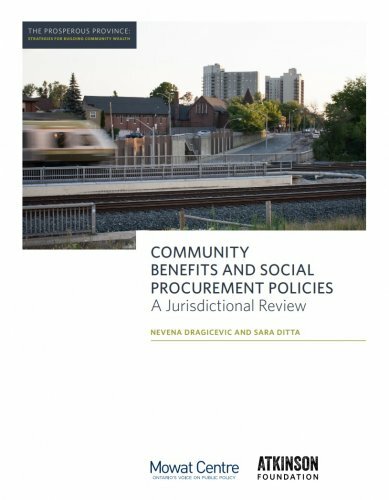 This jurisdictional review examines the current context of community benefits and social procurement policies in Canada, U.S., UK, and Australia. It reviews the trajectory of the policies, their structure and their impact, where supporting evidence is available. It analyzes the objectives, scope, and strengths of the policies and concludes with key challenges and strategies for success from leading jurisdictions.